the variation in women's clothing sizes! 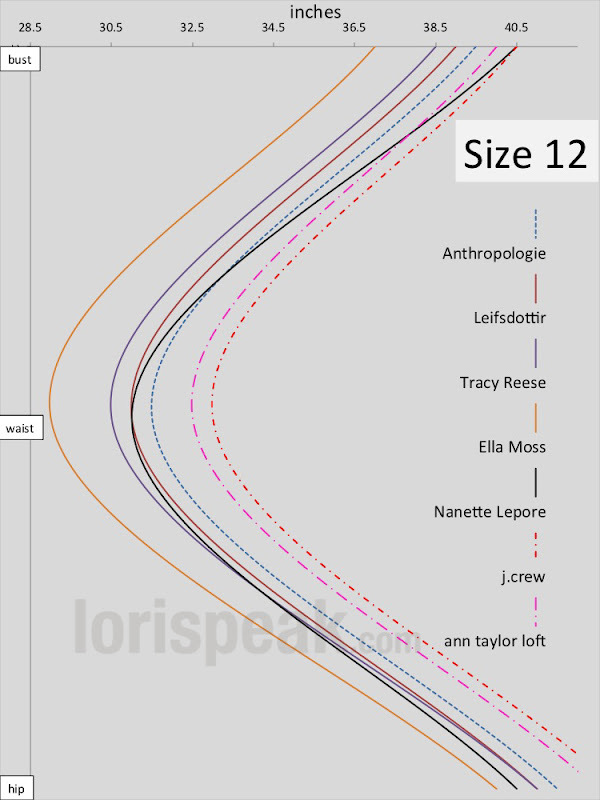 Everyone in the fashion blogging community knows how impossible it is to know one's size across brands (and within brands the consistency and qc just isn't always there!). That's part of why I appreciate style bloggers and the reviews they do for the community. 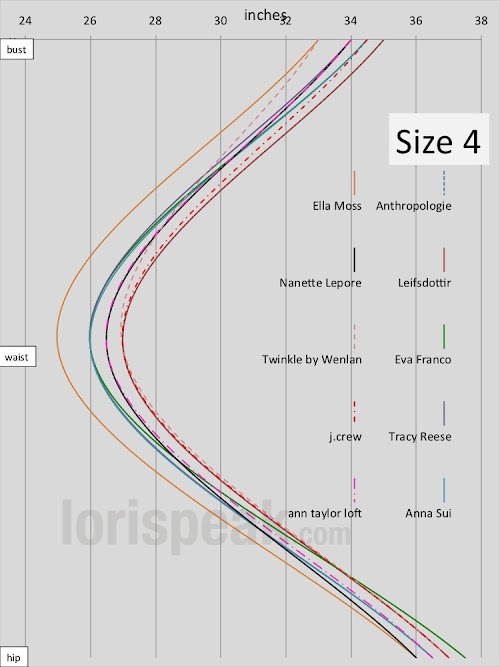 It can make it so much easier to take the guesswork out of which size to try on it what brand... questions like, does it run large or TTS are always tough to interpret since there is no standardized sizing. The NY Times article mentioned there is a company that is putting full body scanners in malls, taking your body measurements, and giving you a print out of what your size will likely be for different stores/brands within the mall. Certainly, this is a useful tool to help with the variability across brands! (although not so much for variability within a brand). 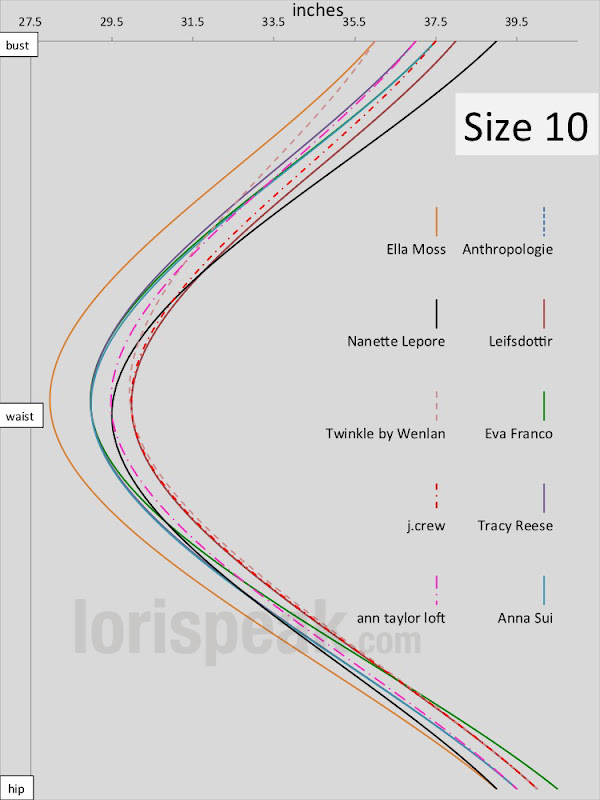 Since there aren't a lot of these size scanners out there, I thought I'd compile a few size charts for y'all of some of the brands Anthropologie carries and a few other brands I like. 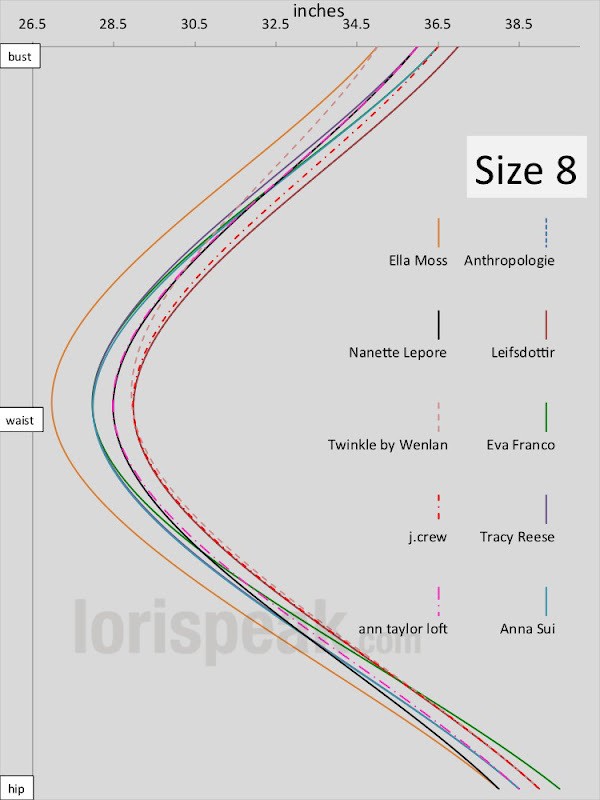 Unfortunately, Anthro doesn't give different size guides for its in-house labels (although we all know they seem to have very different sizing standards). 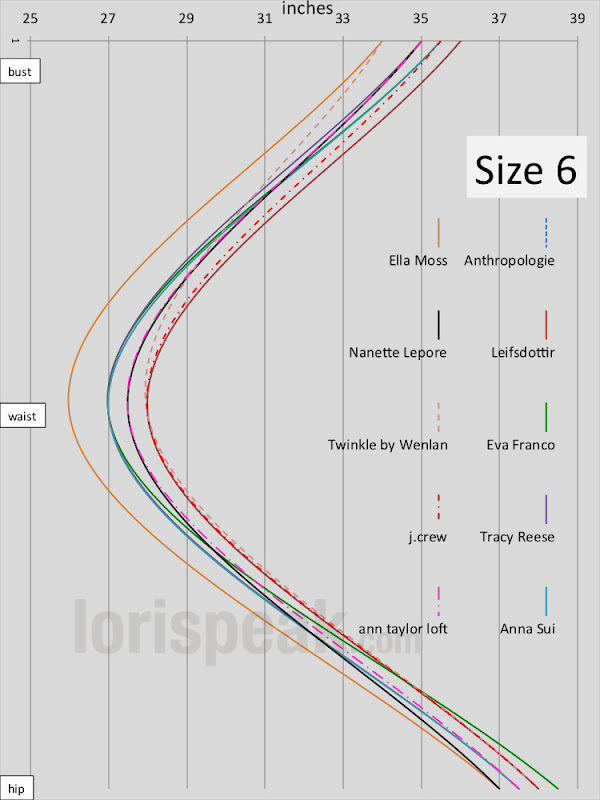 If you know of any size charts for brands that could be added here, let me know (send me a note: lorispeak [at] live [dot] com). Hopefully this could be helpful to some of you out there. To use the size charts, you need to know your bust, waist, and hip measurements. Knowing these things is also super helpful if you buy clothing on ebay or from fellow JCAs or the EA Trade Market. Most sellers are quite accommodating when asked to provide these measurements. If you don't have a tape measure, use a string to get your measurements and then use a ruler to measure the length of the string. See instructions on how and where to take your bust, waist, and hip measurements here. Since I already had the data compiled, I thought it might be nice for some people to look up their size according to their size of one of their body parts. For instance, I know that I have large hips, and they're often the limiting factor for skirts. 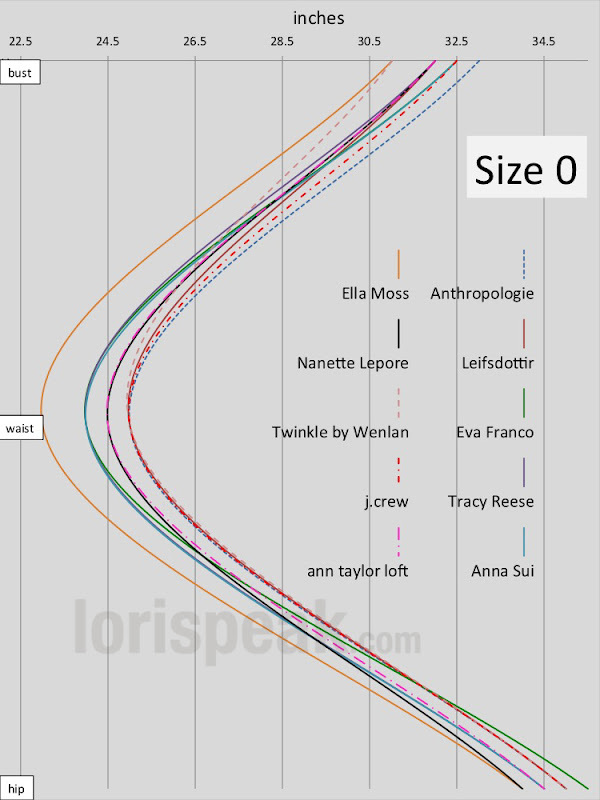 So I could use just my hip measurement to see what size I am across the brands. 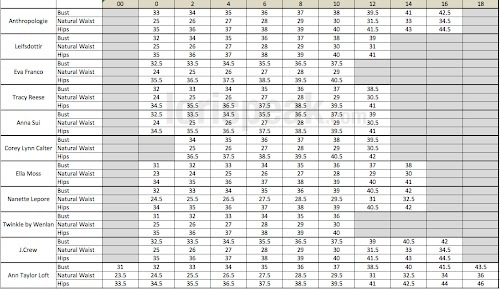 Analogously, my cousin often has to buy dresses that can accommodate her larger chest size, so using the size chart by bust size may be more helpful for her. note: for the only following three size charts, half inch measurements were rounded down. so if a brand's size 0 fits up to a 35.5" hip, I put size 0 under 35"
This is awesome, Lori, thanks! I think more retailers should do like Boden does - they list the measurements of the physical clothes in their sizing so each person can figure out their own right size to purchase. 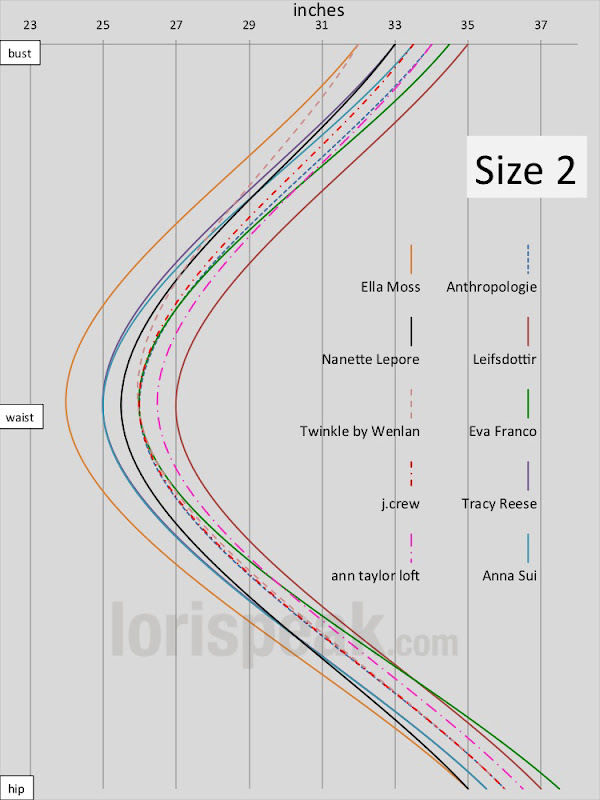 I don't even glance at the typical size charts anymore because none of their "body measurements" ever really match up to the clothes! Very interesting. Thanks so much for the info/graphs. I agree with Lisa - why can't all retailers simply list the actual measurements? That would make it so much easier! WOW! This is a great post, Lori! I'm so glad that you thought to post about this. Just the other day I was griping about how I don't even know what my size is anymore. It helps for some people too who are stuck on a certain size as being "there size" and "not being able to find something that fits". This really points out why I have such a difficult time with dresses fitting. What do you do when your Bust is a 4, your Waist is a 6, and your Hips are a 2. This is such a valuable tool for the internet shopper. Thank you many times over Lori. 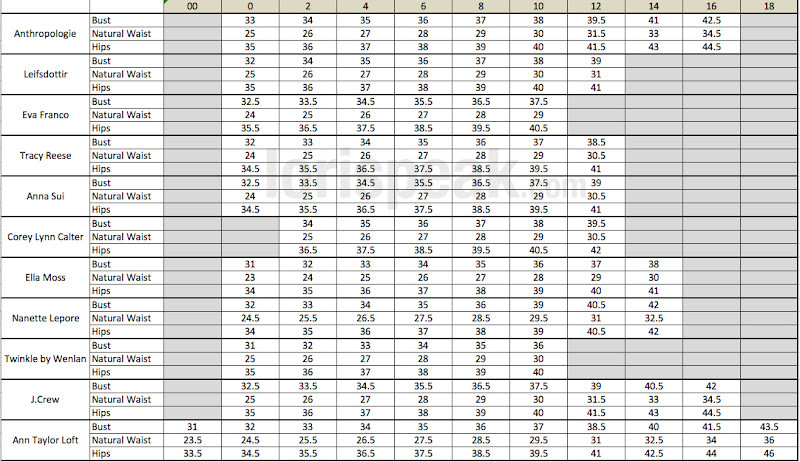 Those charts are pretty helpful (although brands sometimes vary in their own size depending on outfit). =) Thanks for making this post. This is totally helpful, though I guess I shouldn't be celebrating any "weight loss" when I go down a size randomly anymore (; Thank you! A list with actual measurements would help a lot. Great presentation of the sizes by the way.